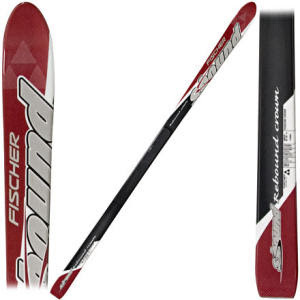 Last winter my father-in-law gifted both myself and my wife a pair of '06 Fischer Rebound Crown skis. These skis so far have been outstanding in the backcountry, sporting an 88-60-78 sidecut with full metal edges and a love of deep powder. The most cambered ski of the series. The Rebound features our S-Deck and Turning Crown technologies with 28 mm of sidecut for easy turning in all conditions. My vitals include 70" height and 165 lb. weight and my Rebound Crowns are the 169cm version. I could've gone with the 179's, however made a personal decision that I would likely not be carrying a full-pack or similar on these skis at any point in the near future and that the primary pupose of these guys was for maneuverability and control off the beaten trail. My wife is ~63" and skis with the 159's.